Product prices and availability are accurate as of 2019-04-10 02:39:53 UTC and are subject to change. Any price and availability information displayed on http://www.amazon.com/ at the time of purchase will apply to the purchase of this product. 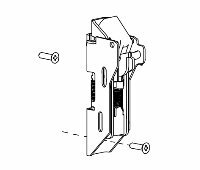 VON DUPRIN 050400 98/99 98/9927/98/9957 Top Latch Kit Less Cover for the 98/99 Series. Package of 1.